The newly established Biorisk Management Facility (BIMAF) recently organized its first ever training — on Modeling under Climate Change Scenarios, 16-20 October, in the IITA station, Republic of Benin. BIMAF offers the first ever training for national partners on how to deal with climate change challenges. The training provided an overview of potential insect modeling tools available and offered a data analysis opportunity to participants that included students and scientists working on climate-driven biorisks and invasive alien species (IAS). Among important IAS are the tephritid fruit flies, which cause major losses in fruits and vegetables, and the devastating Fall Armyworm (Spodoptera frugiperda) that is now ravaging maize fields throughout sub-Saharan Africa. The milestone training covered practical aspects of using suitable insect modeling tools such as Insect Life Cycle Modeling (ILCYM), and Maximum Entropy modeling of Species Distribution (MaxEnt). The ILCYM software facilitates the development of pest insect phenology models and provides analytical tools for studying pest population ecology. The software consists of two main modules. One, the “model builder”, facilitates the development of insect phenology models based on experimental temperature data of a specific pest. This module also provides tools to analyze an insect life-table and to validate developed models. The second module implemented the phenology model in a GIS environment and allows for spatial — global or regional simulation of pest activities or “pest risk mapping”. The ILCYM software provides an open-source computer-aided tool for researchers and students using advanced modeling techniques. The 5-day training included hands-on practical sessions where users could use sample files or their own datasets and discuss their results with the trainers and fellow participants. The training had 23 participants from seven countries across sub-Saharan Africa including Benin, Cameroon, Kenya, Nigeria, South Africa, Sudan, and Togo. IITA Benin colleagues at the BIMAF training. The establishment of the Biorisk Management Facility (BIMAF) was initiated by IITA and partners under the auspices of the West and Central African Council for Agricultural Research and Development (CORAF/WECARD). It is the first concrete action in the overall strategy of CIRACC (Centre International de Recherche pour une Agriculture Résiliente aux Changements Climatiques). 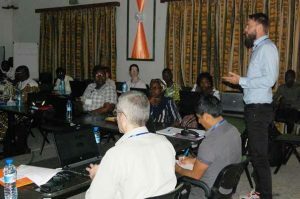 The Center was established during a workshop on “One-health Approach for Mitigating Climate-Driven Biorisks in West Africa,” held in October 2016 at IITA-Cotonou. 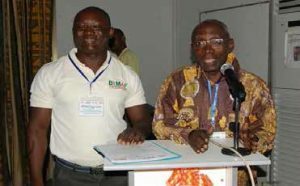 While CIRACC is implemented through the Ministry of Environment of the Government of Benin, BIMAF has an independent Steering Committee and is under the fiduciary responsibility of the IITA Board of Trustees. In the near future, BIMAF will facilitate the development of multi-country projects to fit the continental reach of CIRACC, identify new agricultural challenges, and outline future actions needed to meet priority goals. It also emphasizes the need for improved collaboration with key partners and coordination with existing strategies. Incoming projects will involve not only researchers, but also civil society, including farming communities, nongovernment organizations, and public and private structures to sustainably address challenges posed by biotic stresses and climate change on agricultural production. During her first official visit to IITA-Benin as IITA Deputy Director General for Research for Development attending the BIMAF International Scientific Advisory Panel (ISAP) Meeting, May-Guri Sæthre had a debriefing with IITA Benin researchers and stated that she was confident in the appointment of Ghislain Tepa-Yotto, IITA Visiting Scientist, as Coordinator of the newly established BIMAF. As the technical branch of CIRACC, BIMAF aims to catalyze collaborative linkages between national, regional, and international research and training institutions on climate smart agriculture and to foster synergies in the development and deployment of Center activities in West and Central Africa. BIMAF aims to establish a coordination mechanism and provide a framework to guide decisions on mobilizing resources and focus towards identified priorities. So far, a strategic plan which provides the roadmap for delivering high throughput impact technologies towards mitigating the vulnerability of resource-poor farmers to the adverse effects of climate change has been drafted. It is anchored on experiences and lessons learned in strengthening the building blocks of agricultural innovation systems and increasing farmer and national adaptation capacities through research, training, and outreach.